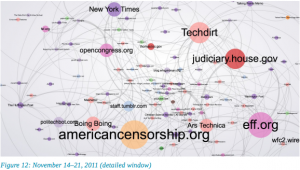 Our open-government community’s efforts are over eight years old now, by my count, and the term #opengov itself seems to be waning in use against the still-interrogated latest big-tent descriptor, “civic tech”. If #opengov helped elevate #opendata for digital transparency, and much of burgeoning “civic tech” focuses on helping governments be more responsive and accessible in their services, these are great results. (See recent unpackings of “civic tech” from two of our ten non-profit advisors, Micah Sifry of TechPresident and Tom Steinberg of mySociety.) But that’s leaving a major gap: with so much energy and money sunk into electoral politics, who’s making open tech for a modern, trustworthy democratic process? I submit the Next Big Thing in Open Government will be open-source tools for civic engagement, defined here as tools for closing the feedback loop from communities to elected officials. I foresee another wave of free software development will drive wider adoption of open data standards, which will help popularize open-data tech for civic participation. First, a new “liquid democracy” platform for communities to discuss and advance policy positions to their elected officials (put broadly, and not targeted primarily at Pirate Party-esque user communities). This would differ from Facebook in being non-commercial, differ from NextDoor in not necessarily being closely-location-based, and differ from discussion platforms such as Mindmixer in being open-source and open-data. 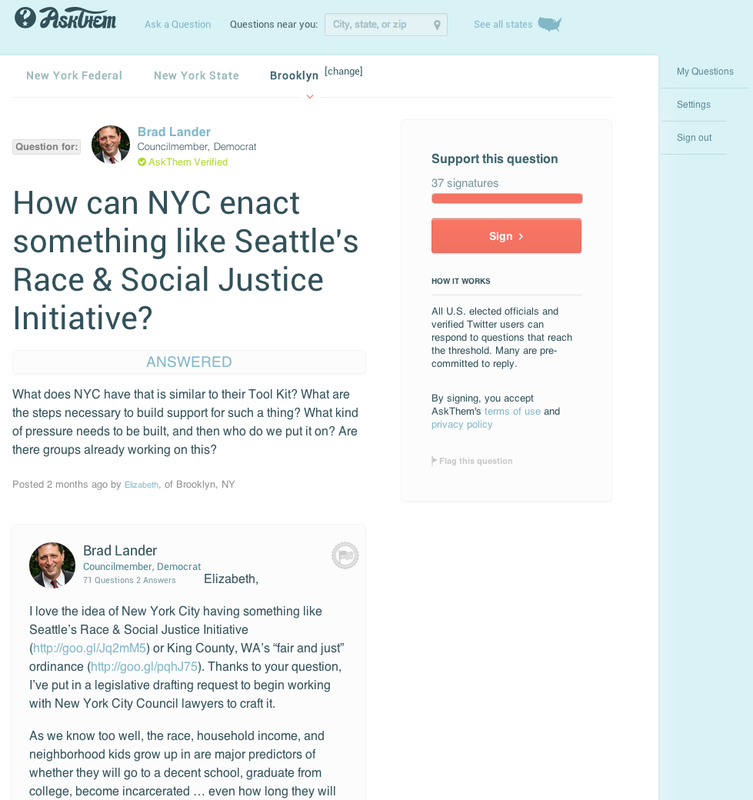 An early version is our Q&A platform, AskThem, which works nationwide at every level of government. 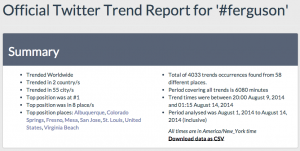 Social media trends around Ferguson protests, via some service iTrended (http://goo.gl/QKSrcp). Delivery of political actions from closed social media updates to open public data. If a Facebook user posts a valid (say) 350.org URL and a campaign hashtag on catastrophic climate degradation, that action can be delivered to her state legislators and U.S. House office, and count her as an environmental advocate in her jurisdictions. 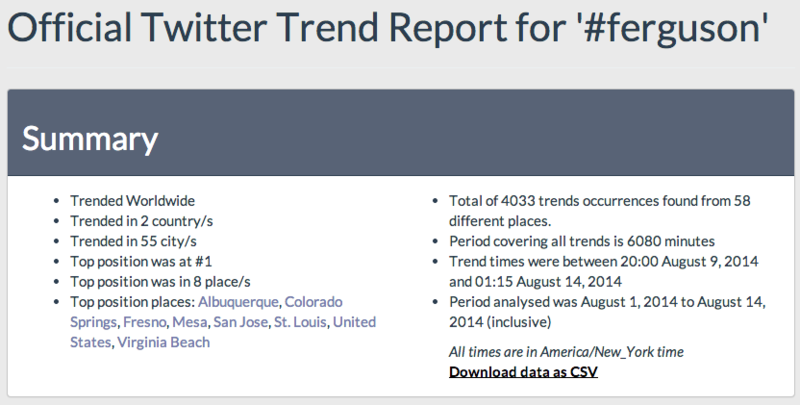 We can pull hashtag activism into the networked public sphere! Write-your-rep tools from any webpage. Through a browser plugin or in-page widget, a visitor to a Guardian U.S. page on climate change can take action directly on that page, in a way that’s conveyed directly to all the staffs of her government at federal, state, county and municipal levels. This has never existed before for the public benefit, a networked “take action” button on news stories & blog posts, but with open standards for conveying public ideas as constituent communications, it can. 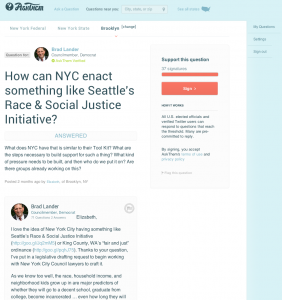 “Councilmatic 2.0” – we seek funding to bring this open-source app to NYC and nationwide. Third, an open CRM for delivering these public messages to government entities, tracking their status towards a resolution or legislation being introduced, and sharing official responses back to the community. This would work a bit like myMadison.io from the Open Gov Foundation, but not only for existing long legislative or legal texts – more like for the issues raised in a Congressional-district-based Liquid Feedback platform, then delivered transparently to government. A baseline comparison is the public email inbox ticket-support queues offered by user-support software, but used instead of closed government CRMs. 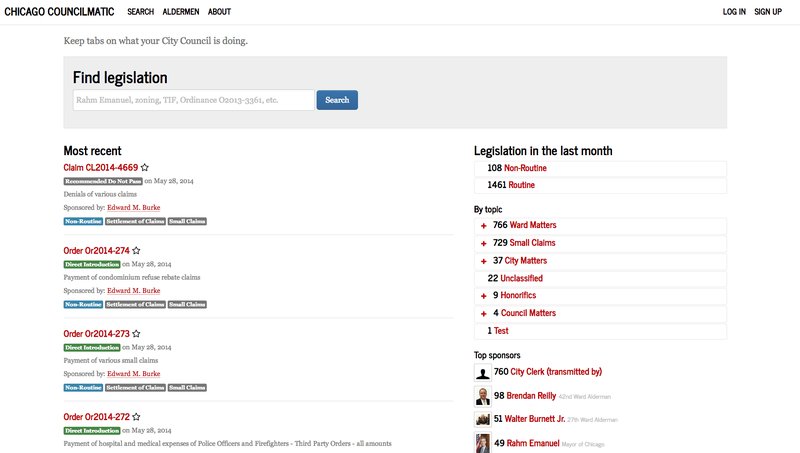 This would integrate with outside platforms such as Councilmatic – see the great Chicago version above – which we propose to bring to NYC and hundreds more cities in the months to come, in partnership with the new Open Civic Data API. In coordination with the rad civic hackers at DataMade, Sunlight Labs leadership, and over ten leaders of Code For America Brigades nationwide. 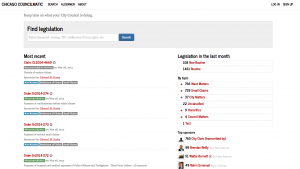 Legislation drafted and voted on by constituents on LiquidFeedback or Councilmatic, and delivered via open standards, could be tracked on an official government CRM towards resolution. Really validating and closing the feedback loop with government officials, some of which are already interested in using Councilmatic, e.g. here in NYC Council. PPF has actively supported the DemocracyMap.org open data community project – to access all of your reps.
Fourth, the longtime dream of open government data for every elected official nationwide by jurisdiction – finally making DemocracyMap happen. To be clear, Democracy Map’s open-data mission is being continued by groups such as the awesome Google Civic Information API (Go Google Civic, as well as our non-profit advisor Anthea Watson Strong and others – we’re glad to use the API on AskThem), as well as Open Civic Data and even the federal Data.gov. But towards the longstanding puzzle of: how to effectively obtain & re-publish standardized, official data for most-local government entities – if the crowdsourcing model may not scale to over 20,000 municipalities nationwide – offering the above-listed free tools as incentive to government entities to publish their contact & member data in open standards may help significantly push things forward. Putting much of the above together will make possible a new generation of “keep me updated” tools for anyone in the U.S., to customize updates and notifications from everyone who represents them – via Councilmatic and an open CRM for state/local government – which Tom Steinberg has identified recently on Twttr as a priority and area of opportunity for civic tech. PPF announces Contact-Congress features on OC, summer 2011 – help us build more of this, please. 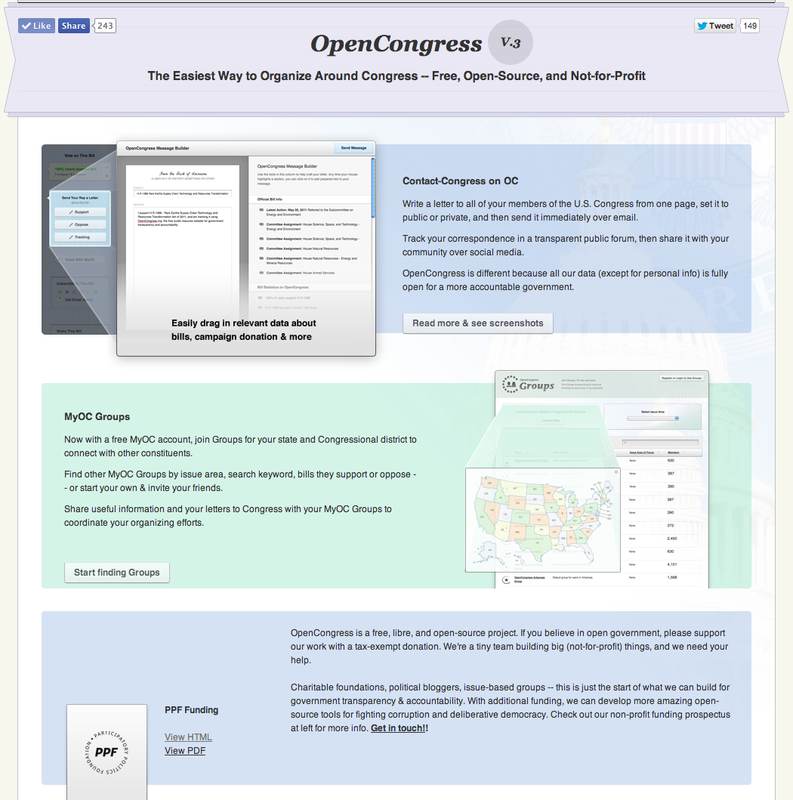 With all the open data liberated in the past five years, why aren’t there more open-source tools for civic engagement that have gathered more than, say, up to 1 million web visits per month, on the scale of our previous initiative, OpenCongress (now with the Sunlight Foundation)? My hypothesis is that much of the above-outlined open-data infrastructure was missing in the U.S., preventing investment in truly open-source tools as shared public platforms. Much civic-startup capital the past couple years is going towards great, great projects that scale like apps in the Code For America ecosystem. But I believe the open, non-profit tools I outline above would radically transform an under-served individual’s interaction with government – to be able to track the status of your supported policy priority, or your neighborhood idea, or your complaint, in the public pipeline. If the broad goal of “civic tech” is enabling government to improve outcomes in public policy and in our daily lives, then funding more open technology for civic engagement offers significant opportunity – with the considerable leverage of low-hanging fruit such as the above-listed projects. We need far better tools to actually implement bottom-up policy ideas throughout U.S. government, enable urgent electoral reforms, and thereby finally lay the groundwork for stronger civic engagement – the kind that builds personal trust and community equity in the political process. Recall the incredible social motivation and radical awareness raised by this past August’s terrible events in Ferguson, MO. Many of those feelings of anger & incredulity are essentially political – many experienced by people who are less-connected to the political process – but many of these feelings will be lost in the ether, or won’t be hooked-in to actual reform efforts. Wouldn’t it be awful if the protest energy brought to life by the death of Michael Brown and the Ferguson protests just dissipated on social media, such as Twitter? That moment, and so many moments, have potential to be integrated (over time, and with organizing) into what Prof. Yochai Benkler and his research team have termed the “networked public sphere“. On that deeply-interesting term, which I very much seek to advance: its existence in the U.S. political world only been documented a few fleeting times, but I think spreading it would have great untapped potential to improve outcomes in our lives, and we should prioritize free technology for its practice. In working in civic technology for the past eight-plus years, and before that in political organizing, this is among the biggest paradigm shifts I see available at cost: pulling public issue reporting out of the one-to-many model, and into the many-to-many model, creating real responsive representative democracy. Think of the gains in civic participation that would result if elected officials agreed to debate popular public petitions, and innovative legislation for community priorities moved up the chain from local to county to state to federal governments. More-popular tools will help address the chicken-and-egg question of funding more development and experiments with open-source tools, when Facebook & Change.org & others are already such behemoths. But I remind, the open-source tool-making field has only seen a fraction of comparable investment over the past eight years (much of it from Knight, to their credit – but relatively little in #opengov to public decision-making apps). 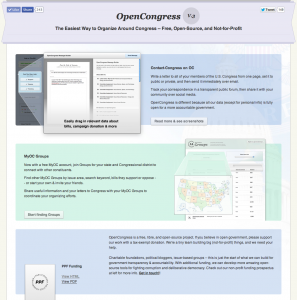 In another blog post I’ll elaborate on the need for mid-project funding for the ideas above, more than mini-grants but less than million-dollar multi-year foundation programs, and suggest metrics of popularity such that any project that receives up to one million visits per month – as our OpenCongress did – receives a baseline of charitable support to afford even one full-time programmer. I have observed the public demand and user desire for such web platforms (Councilmatic, an open CRM) is there, especially on the part of city government leaders, and it’s just the tools that are lacking – a contemporary Facebook or Netflix-esque user experience for responding to the news – which can be built and popularized, with a cultural expectation that real constituent issues deserve to be addressed openly & candidly in the networked public sphere. This paradigm shift, towards an open CRM for constituent communication, has the potential to change the approx. 20,000 municipal governments in the U.S. and be adopted up the chain of government, to counties and states, and eventually even to the insistently-closed-off U.S. Congress. It’s a big change, powered by open data and powerful public accountability, the real promise of open technology. Questions & feedback welcome: david at ppolitics.org, @ppolitics on micropublishing service. Help us build this infrastructure and these user-friendly tools for the public benefit! Please help fund our c3 non-profit organization’s work.